One-on-one meetings are an important way for managers to connect with their team members and provide a dedicated and comfortable space for coaching, communication, and connection. Successful managers ensure that their employees feel valued and empowered, and one-on-ones drive this positive interaction. 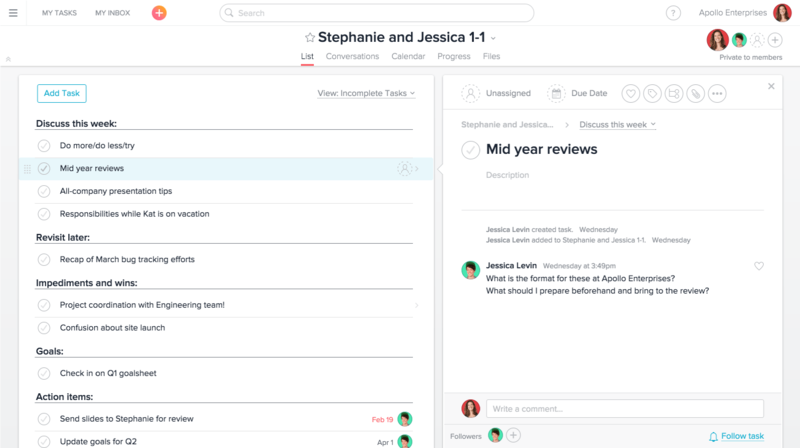 Asana helps you plan your one-on-ones in advance, stay focused during the conversation, and track any action items that come out of the meeting. Set up a private project and invite only your report to join. Private projects are an Asana Premium feature, but you can try them out with a free trial of Premium today. Contribute new topics to your project between one-on-one meetings (both managers and reports should add agenda items). Provide descriptions on the tasks so you remember specifically what you wanted to say. Comment on tasks to discuss work before and after a meeting. Add a task from another project into your one-on-one project so you can discuss it in context. Assign tasks in the action items section and set a proper due date to ensure their completion before the next meeting. Once created, save your one-on-one project as a template by clicking the project header dropdown and selecting Save as a Template. Then anyone in the company can easily create a one-on-one project. You can use recurring due dates on the topics you want to cover every week. Put them in the “Discuss this week” section and they will re-appear each week. Pre-populating the agenda so you can reflect on topics beforehand and approach them thoughtfully instead of on the spot. Contributing ideas throughout the week so you remember them and avoid spending time in the meeting trying to think of what to talk about. Encouraging your report to have a say on meeting topics and priorities to set an honest, safe, and respectful tone beforehand. These meetings are ultimately for your team member to discuss what’s on their mind. Checking in regularly on goals, career planning, and growth opportunities to ensure greater commitment to achieving them. Setting aside time on your calendar for a one-on-one is an important part of being an effective team lead. The consistent and honest feedback that emerges brings out the best in your employees. Emphasizing professional growth, talking through roadblocks, and prioritizing ideas together ultimately drive careers and organizations forward.